Once you've had your design proposal accepted, what's the next step? The sponsored yarn for this project came in hanks, so my first step was to wind one hank of each color yarn into center-pull balls. 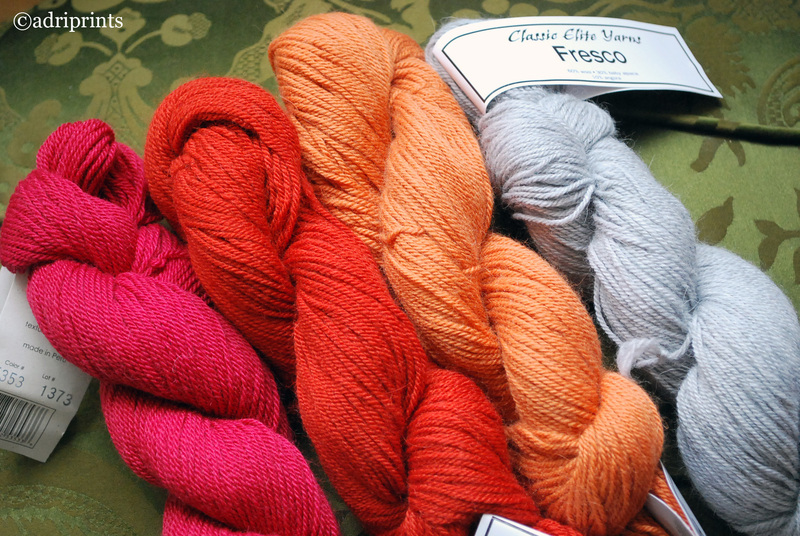 Then, I began the gauge-swatch process because the gauge of this yarn was different from that of my proposal. I knew the project would entail some ribbing, plain stockinette, and also fair-isle. 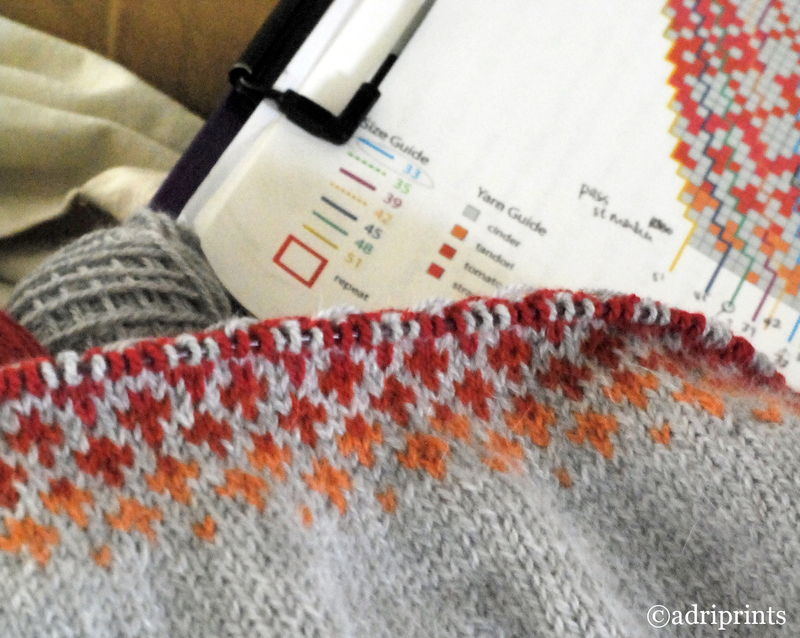 So, I made swatches of all three areas to make sure my math worked out for the end-knitter. I also used the first swatch in fair-isle to see if I liked the planned progression of color in the final yarn. Once I had a good idea of the pattern numbers based on the swatches, I wrote a rough draft of the pattern including the various sizes. 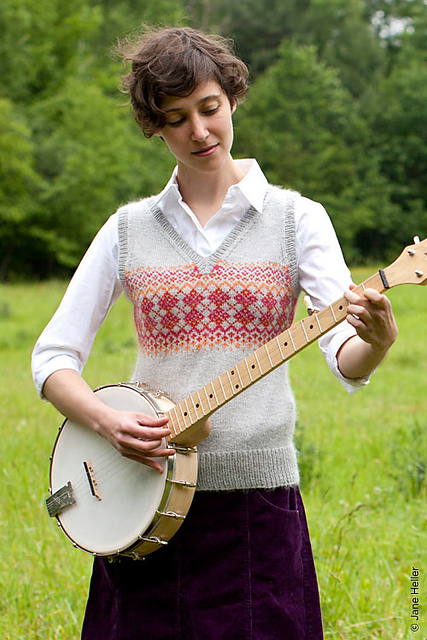 I went through the early drafts of the pattern and then knit the sample based on this draft. So, even after the sample was done, there were some changes that needed to be made. Although it's not ideal, some things you just don't see until after you've knitted it and see the garment as a whole! The pattern was then test-knitted by a team of test-knitters who followed the edited second draft. After assessing all the data gathered from the testers, I updated stitch counts, faulty charts, and edited any unclear text. Then, I packaged schematics, charts, the written text, and the sample. The sample was shipped off and the draft e-mailed to the publishers (the Twist Collective team). Several weeks later, when the editing team was ready to work on the Fall issue, I received an e-mail notifying me of their progress. After that, we went back and forth reviewing and editing a pre-press formatted version of the pattern. Both sides are responsible for checking numbers, schematic accuracy, language, grammar, knitting terminology and conventions, etc. Then a few weeks after that, the photos were processed and edited, and finally the pattern was published!